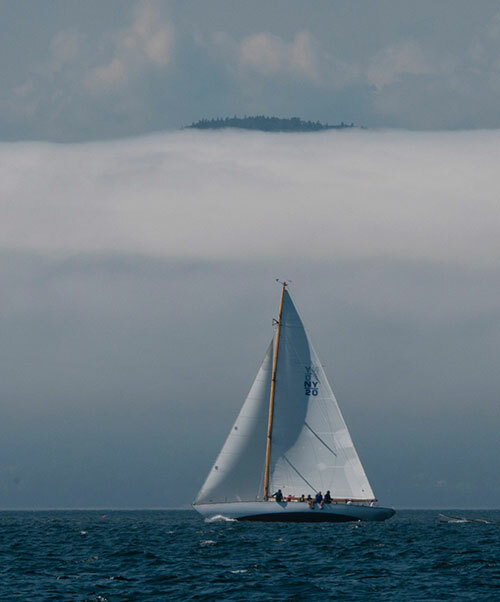 Castine, Me.—Leaf, a 38’ Luders 24 sloop sailed by Chris Bouzaid, led the fleet in the Eighteenth Annual Castine Classic Yacht Race to Camden sponsored by the Castine Yacht Club. 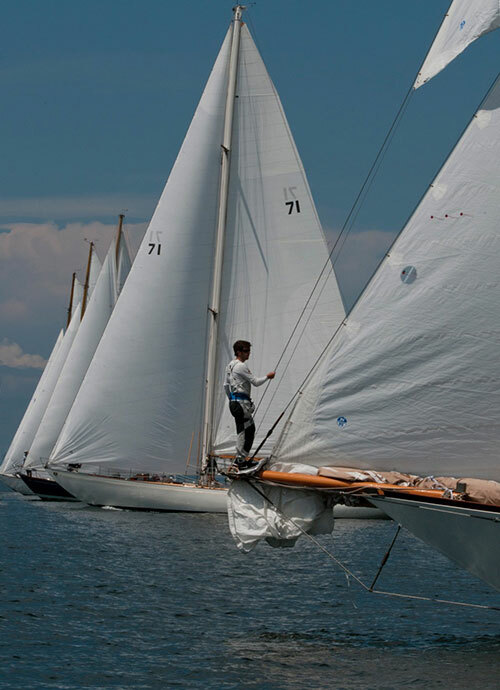 The Castine event kicked off three days of classic boat racing, culminating in the Eggemoggin Reach Regatta, and this summer celebrated the famed designs of Aage Nielsen. 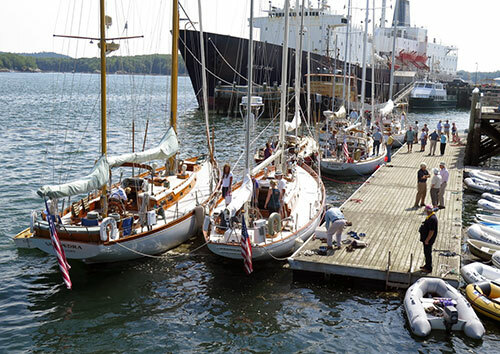 Seventeen Nielsen yachts built between 1955 and 1969 were on public exhibition in Castine. They ranged in size from two 18’ double ended sloops to the 59’ ocean racer Hound. This was the largest collection in history of Nielsen yachts, according to David Bicks, chairman of the event. “The response of the Nielsen community was overwhelming”, Bicks said. The Nielsen fleet was honored before a packed audience at the Maine Maritime Academy at a symposium chaired by Douglas Adkins. The symposium featured Tom Jackson, co-author of the leading treatise on Nielsen; Matt Murphy, editor of Wooden Boat magazine; Joy Phillips from Tasmania, owner of Holger Danske; Frank Eberhard, owner of Hound; Taylor Allen of Rockport Marine, owner of Northern Cross; Frank Schattauer from Seattle, owner of Tioga; David Connolly, owner of Taygeta; and Bill Peterson, naval architect. The speakers extolled with affection the remarkable form, detail and seaworthiness of Nielsen’s designs. Nielsen immigrated from Denmark to the United States in 1925 to work with John G. Alden in Boston. In 1936 he became the sole designer in the Boston office of Sparkman & Stephens. 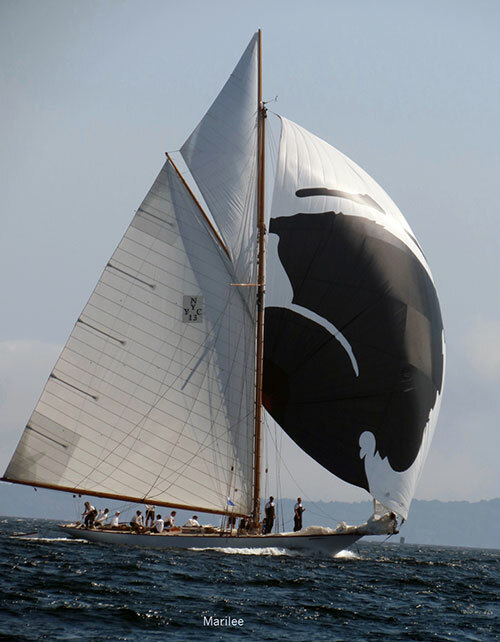 His designs ranged from small craft and keel-centerboard racers to the largest Alden schooners. Under clear skies and a brisk southwest breeze, the thirty-six boat fleet set sail in four classes from the Castine harbor bell on a 19.6nm course ending off Curtis island in Camden. Sailing in Classic B class, Leaf beat by almost four minutes Palawan, a 47’ Sparkman & Stephens yawl sailed by Scott Gazelle. 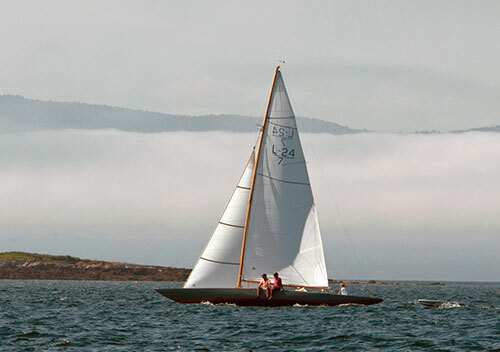 Otter, a 41’ Concordia skippered by Robert Keefer, took third place. 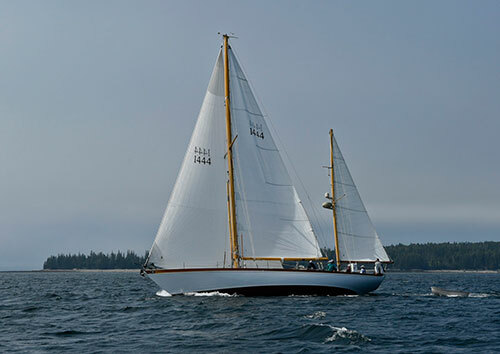 The Classic A class featured five 45’ New York 32’s, designed by Sparkman & Stephens and built in 1936. 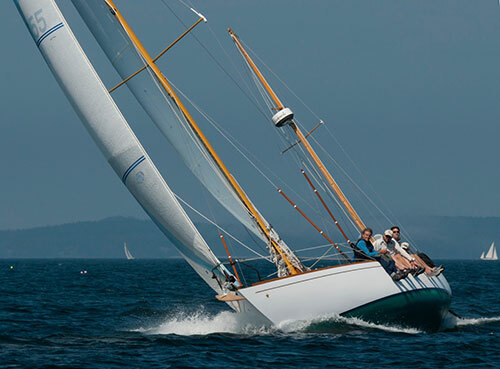 New York 32 Siren, sailed by Peter Cassidy, took first place, followed by NY-32 Vitesse, skippered by Matthew Schoman. The 55’ S&S yawl Santana, sailed by Connor Wallace, took third place. The Classic C fleet was led by Pride, a 32’ Buzzards Bay 25 sailed by JB Turner, followed by Jolle, a 36’ Winslow yawl skippered by Charles Haines, and Abigail, a 39’ Alden ketch sailed by Jesse Terry. In the Spirit of Tradition class, Isobel, the 68’ Stephens Waring sloop sailed by Richard Schotte, took first place, followed by Pleione, a 48' Taylor 8 Meter sloop sailed by Bruce Dyson. Vortex, a 52.5' Reimers sloop skippered by Steve White, took third place. At the award ceremony at Wooden Boat School following the Eggemoggin Reach Regatta, Brooke Parish of Castine presented the Ames Cup to Leaf as overall winner of the Castine Classic Yacht Race. The Ames Cup honors the memory of Richard Glover Ames and Henry Russell Ames who were lost at sea on June 19, 1935, south of the Grand Banks in an unsuccessful effort to save their father who was washed overboard during the Newport to Bergen, Norway yacht race. The Ames family hailed from Castine. Siren won the Sparkman & Stephens trophy awarded to the S&S boat with the lowest corrected time. The Phalarope trophy, awarded to the top Concordia yacht in memory of Thomas G. Ashton Sr. of Castine, was presented to Otter. 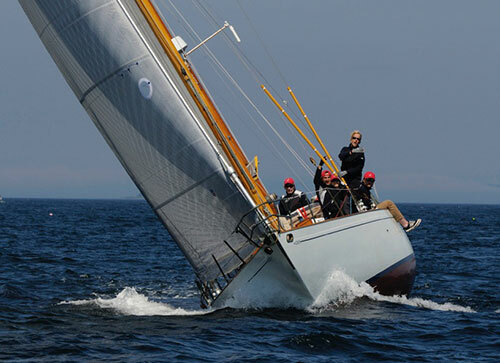 The Mitch Gibbons-Neff trophy, presented in memory of the late head of S&S, was awarded to Siren as top New York 32 in the Penobscot Bay series.